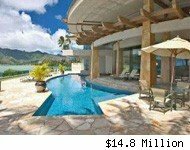 This spectacular, $10 million villa in Kihei, Hawaii boasts over 10,000 square feet -- which includes 7,487 square feet of interior space and 3,757 square feet of lanai. 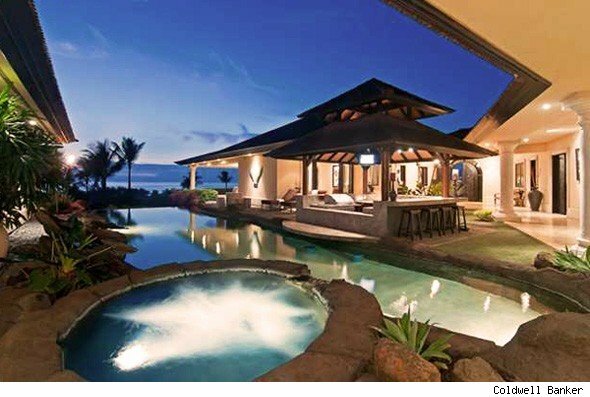 Outside is a sunken cabana with swim-up bar, full outdoor kitchen and vanishing edge lagoon pool with hot tub-ideal for entertaining amid Maui's lush vegetation and cool breezes. A majestic 35-foot waterfall anchors the property. The stately formal entrance opens to a magnificent courtyard that connects each wing of the house. Inside is a visual feast of luxurious furnishings and appointments, including hand-carved stone columns and fine wood cabinetry. A spacious gourmet kitchen features leathered-marble countertops and professional-grade appliances. 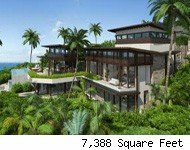 Other amenities include lavish bathrooms with marble fixtures, a home theater with stadium seating, and stunning tropical views of ocean and island throughout. Palauea Beach is a short walk away, along with the numerous hotels, shops, and restaurants of the Makena/Wailea resorts. Coldwell Banker Pacific Properties has the listing. 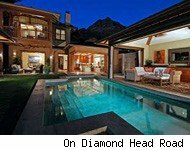 Click on the images below to see more homes for sale in Kihei, Hawaii.